Log stores are without doubt the best way to store your logs, whether it’s unseasoned, seasoned or kiln dried logs that you will be storing. Contrary to popular belief, the best log stores are those which aren’t enclosed – a good store should have vents on both the back and sides to ensure good air-flow is possible to avoid damp and mould growth. Our small log store comes with a high quality ship-lap roof (inter-locking boards), as opposed to inferior feather boarding – this keeps the rain away without seeping through in to the top layers of your logs. Our log store is built in the UK using all natural wood throughout and pressure treated to ensure they remain free of rott for years to come, with extremely thick boards all-round for a robust and sturdy construction. 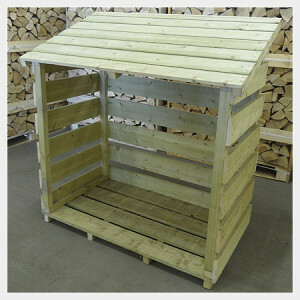 We hold stock of our small log store all year round, and can deliver within days of your order. Please note our log store can only be purchased with our logs and not separately. The perfect small log store for storing your kiln dried logs..